While waiting for the new patch to be released (v233), we’ve looked into the DevKit once more. As usual, we found some nice additions that we wanted to share with you. 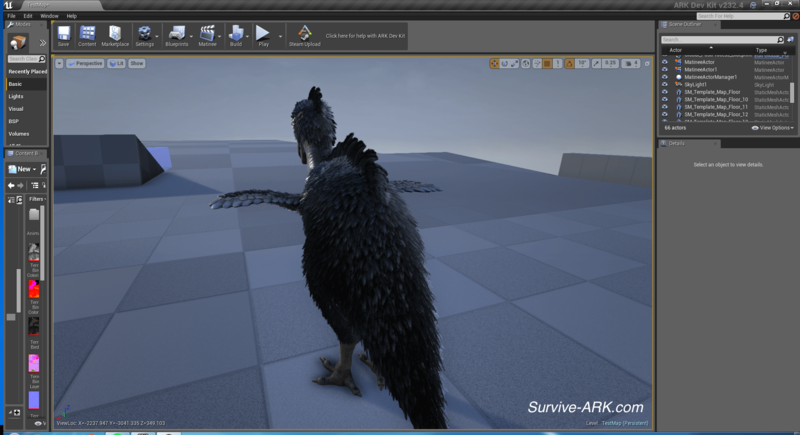 These include the Terror Bird (but with feathers! 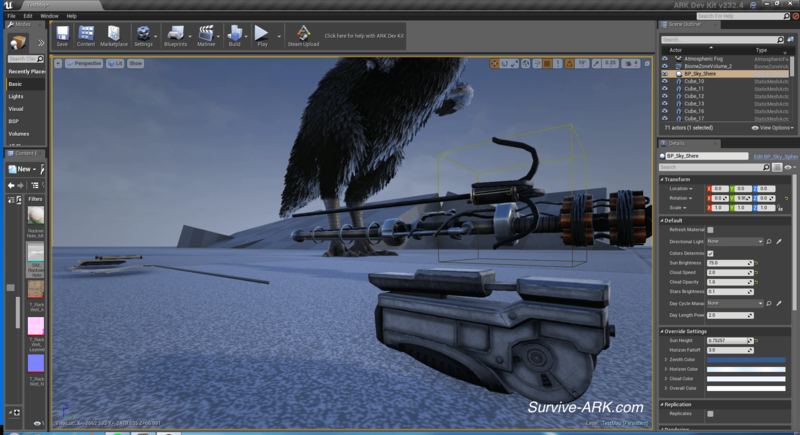 ), the upcoming electric prod, a new weapon called the grappling hook and some more lore related items: explorer notes. 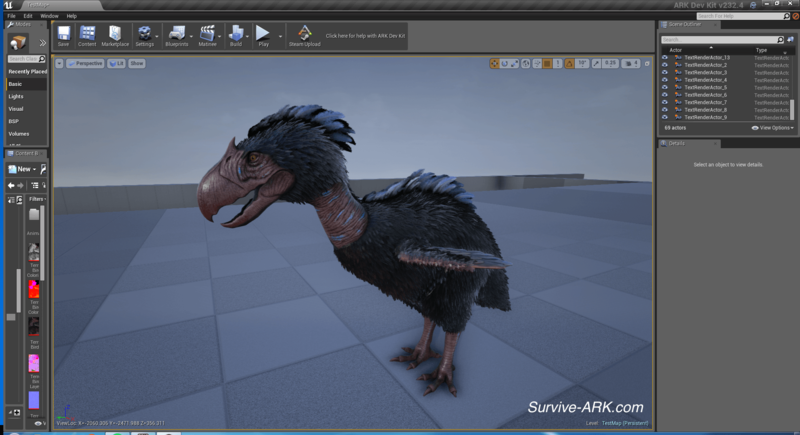 There is also a preview of the Gallimimus and SWAT armor available in another post that you might want to check out. 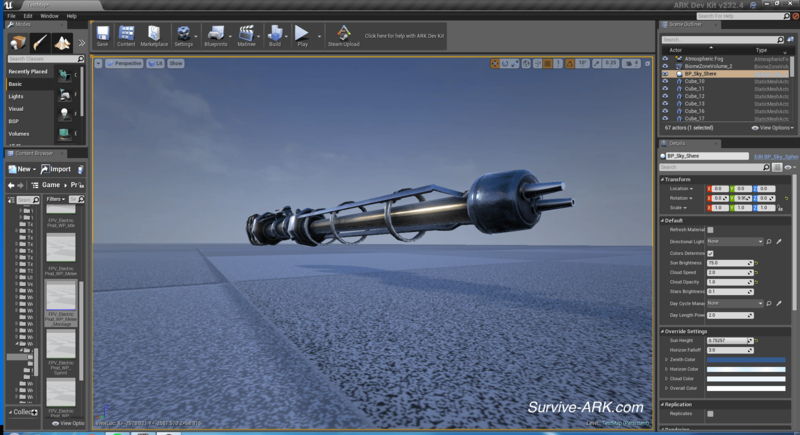 With the upcoming patch, we will get access to a new weapon: the electric prod. Although it has been around in the Dev Kit for a while, we thought it was a good reason to dig it up again. This might not be the first time you see it, but it is still nice to see what lies ahead. Can you see yourself electrocuting little Dodo’s already? We can.. 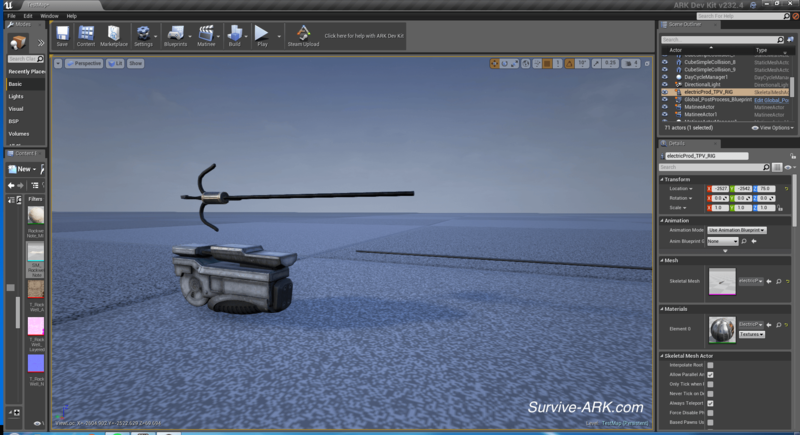 The Dev Kit also contains a new weapon: the grappling hook. 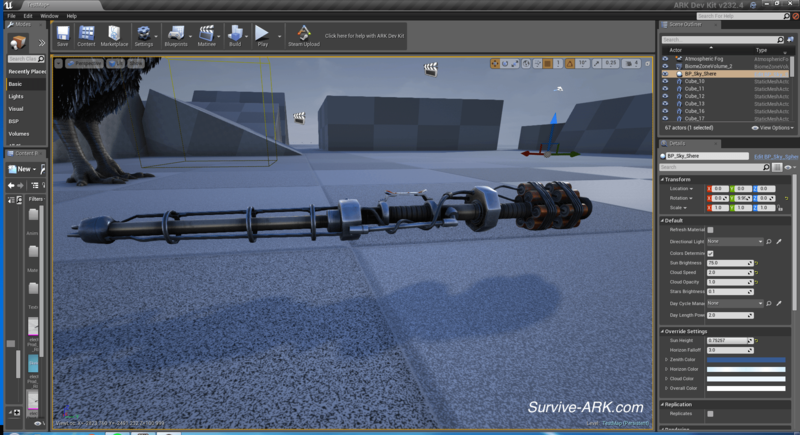 Currently there is not much of it present yet, except for the gun itself (that is divided into three parts that cannot be separated at this point). It consists of the gun, the hook and presumably part of the rope that will connect the two. We’ve already covered the explorer chests, but there are also explorer notes available. 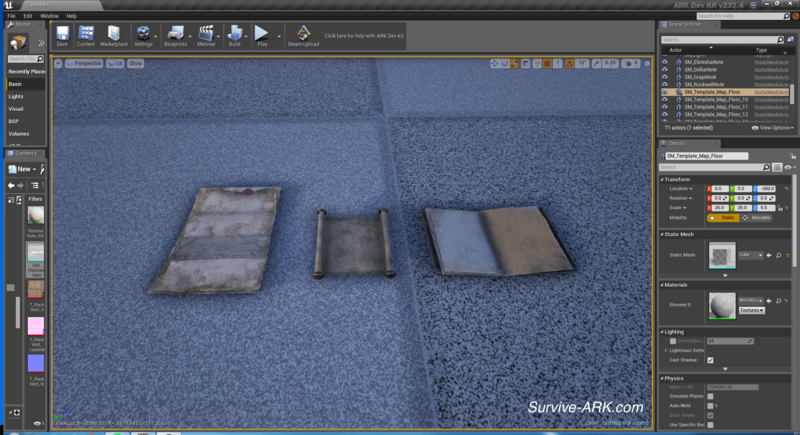 Maybe we will be able to find these scattered throughout the ARK in one of the future updates? Only thing we can do at this moment is guess. What do you think these notes will be used for? 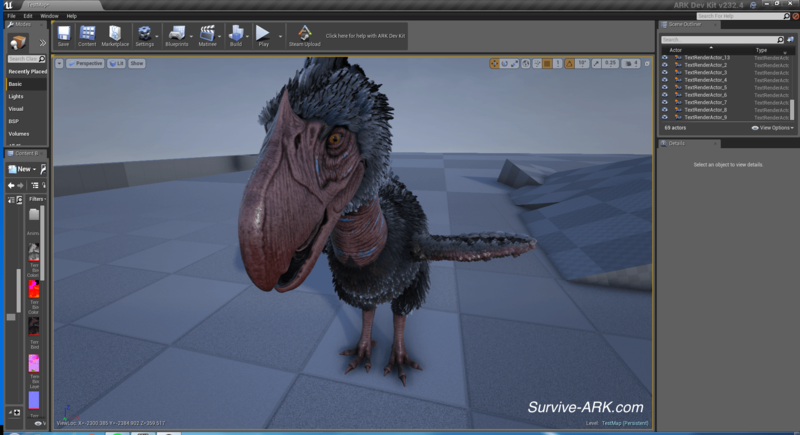 There is so much we don’t know about ARK and the island yet, hopefully they will release some more lore soon. Therizinosaurus’ neck and head look totally wrong. It looks more like a Godzilla movie villain. That “lol shark fin” on Dunkleosteus looks ridiculous also. To be honest, the TB could be given a more scarier looking beak. Make it thinner around the (teeth?edges?) to make it look to have better slicing ability, and maybe make it pointier in general? The lore notes seem interesting. Will they tell of past survivors stories? Such as dossier guy, and maybe make it so that instead of just finding a dossier the moment you kill/tame something, (Hey, where’d this book come from?) make them appear around the map in say, old ruined structures, ex saddle level 5-15 moldy thatch houses, 20-35 burned down wooden house, so on. Encourage adventure, that’s for sure. And help tame or fight off these creatures without trial-by-fire type things.